This is the first in a series of columns reporting the findings of the PMA 2011 Benchmarking Report, published last December. • Profits in 2011, as measured by earnings before interest and taxes, averaged six percent of sales, up from one percent in 2010. • Performance has improved from the previous year in inventory turnover, receivables turnover, success rate on new quotes, capacity utilization and employee turnover. • The industry continues to show strong performance relating to safety. • The percentage of participants reporting negative earnings decreased from 37 percent in 2010 to 15 percent in 2011. • Sales per employee and value added per employee—two important productivity measurements—climbed in 2011. Members shared that certain measurements no longer were meaningful, and in some cases additional data is needed to better understand the impact of some measures. For example, a suggestion was made to replace the measurement for unexcused absences with one for unplanned absences. Furthermore, given that almost everyone in the industry has an on-time delivery rate of at least 90 percent, a suggestion was made to start tracking premium freight as a percentage of sales. This would help get a better handle on the costs required to maintain such a high delivery rate, we were told. Lastly, members suggested extending the presentation period in the survey from 3 yr. to possibly 5 or 10 yr. The industry average for training investment as a percentage of overall payroll has remained within a narrow band, between 1.3 percent in 2002 and 0.8 percent in 2010. Although the average is trending slightly downward, at the most profitable companies it’s trending upward. Most of the companies that participated in recent PMA district meetings noted plans to hire additional employees in 2012, but indicated that providing the necessary training will not be an easy task. Safety has steadily improved during the last 10 years. The number of accidental injuries per 100 employees, currently at 6 to 7 instances per year, has dropped significantly from its high of 12 instances per year in 2002. One company attributed its strong safety performance to a highly experienced workforce, noting that an unexpected benefit of the economic downturn was an overall improvement in the quality of its workforce. During the last 10 years, success rate on new quotes has trended upward. 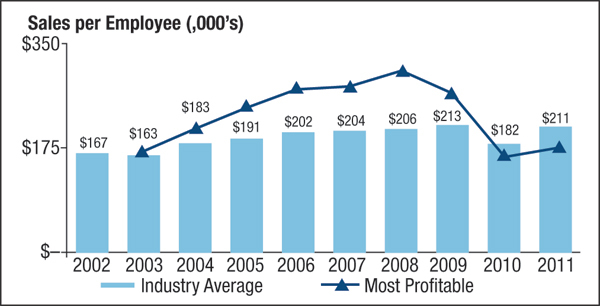 This holds true for the industry average and for the most profitable companies, and since 2007 the most profitable group has consistently outperformed the industry average. At 14.6 percent, turnover has decreased significantly in the metalforming industry compared to an average of 19 to 22 percent since 2002. With the exception of 2009, the most profitable companies consistently registered below-average turnover. One PMA-meeting participant observed that this measurement also has been impacted by recent layoffs. With most companies looking to hire and employee ranks having been thinned over the years, staffing levels are as low as they can be, we were told. The cost of quality shows a slightly downward trend (improvement) as a percentage of sales. During the last 8 yr., the most profitable companies performed better than average. Capacity utilization, as expected, has been on a gradual decline since 2002. While more volatile, this measure at the most profitable companies has been trending downward, but at a much lower rate. This productivity measurement gradually has been increasing since 2002, due to the leaning-out process. The most profitable companies have generally outperformed the industry average, except for 2010 and 2011. It will be interesting to see if this pattern continues in 2012. This is another productivity measurement that has steadily improved. 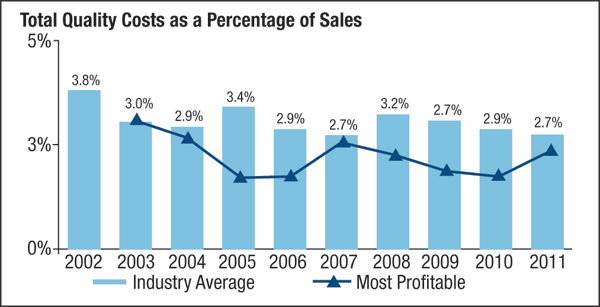 More importantly, however, the most profitable companies als have outperformed the industry average.